Since the summer vacation season will soon be upon us, I thought this would be a great opportunity to explore the use of travel photos as graphical treatments and topics for one’s newsletter. As you travel to your destination, remember to bring a high-end camera to obtain the best quality photos. Simple snapshots from your smart phone will not have the clarity and definition for a professional newsletter or magazine. Let your camera work for you while you are on vacation; you may be on a trip to relax but try not to forget the beautiful photos that lurk beyond. Take as many location shots as possible so that you are not regretting it later when you are 5,000 miles away from your sightseeing extravaganza. Avoid snapshots of people posed in front of monuments so that the photos do not look too “touristy.” Depending on your location, try taking – of stairways, architecture, columns, walkways, gardens, sunsets, or beach scenes. Closeups of the region’s foods taken in outdoor cafés or gourmet markets are also wonderful images to add to your publications. In the example above, we outlined and knocked out the backgrounds from photos of the Colosseum and the Roman Forum, taken from my recent trip to Italy. As in other posts, we wrapped text around these architectural elements to create a dynamic layout for the cover of the newsletter. Then we used the fonts, Linotype Didot for the masthead, ITC Isodora for the headline, and Italian Old Style MT for the body text. 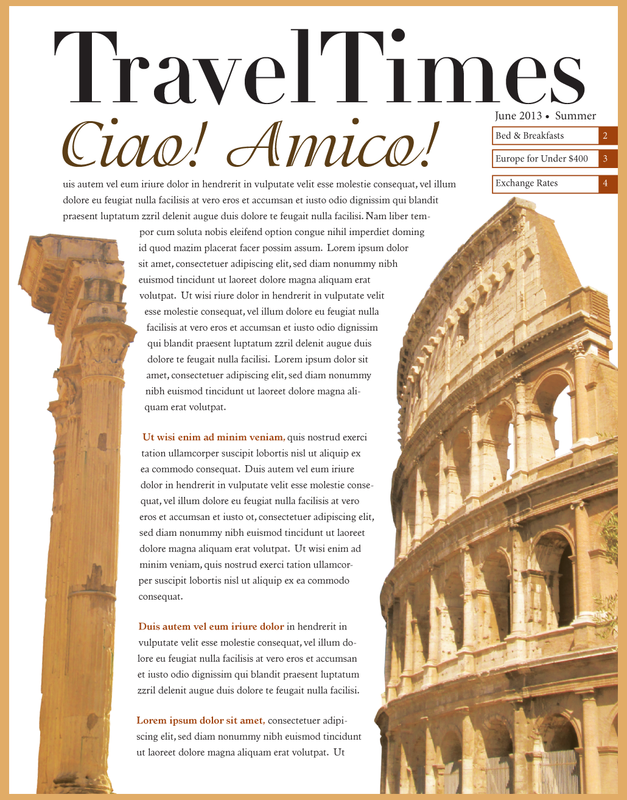 This effect can be used for newsletters on travel, recreation, leisure, foreign language or culture. So, book your vacation now to a far-away land. It will work for you! Ciao! Amico! If you’d like to talk about a design for a newsletter, website or other communication, please drop an e-mail to hwdesign@west.net. This entry was posted in Newsletters and tagged Newsletters, Summer, Vacation by Successful Corporate Communications. Bookmark the permalink.